Description: Filled with cinnamon, ginger, cloves, cardamom, molasses and orange zest, these rolled cookies will thrill all gingerbread lovers. Use any shape cookie cutter that you like. Historic Notes: Another cookie given to me by Joan Eckert. These are her Swedish grandmother Olivia Abrahamsson’s cookies and are typical of Swedish ginger snaps, but this version is extra spicy, flavorful and easy to work with. Whisk flour and baking soda in a small bowl to aerate and combine; set aside. Place butter in bowl of mixer and beat with flat paddle on medium-high speed until creamy, about 2 minutes. Add sugar gradually and continue beating until light and fluffy, about 3 minutes, scraping down the bowl once or twice. Beat in cinnamon, ginger, cloves and cardamom, then beat in egg, molasses and orange zest until well blended. Add about one-third of the flour mixture, then turn machine onto low-speed. Gradually add remaining flour, mixing just until blended. Scrape dough onto large piece of plastic wrap. Use wrap to help shape a large, flat disc then cover with plastic wrap. Refrigerate overnight to allow flavors to develop. (You may freeze dough up to 1-month double wrapped in plastic wrap; defrost in refrigerator overnight before proceeding). Preheat oven to 375 degrees. Line two cookie sheet pans with parchment paper. Using one-third of dough at a time, roll out to 1/8-inch thickness on lightly floured surface; you may need to flour your rolling pin too. Make sure that they are rolled out this thinly as the quality – the “snap” – of the finished cookie depends on it. 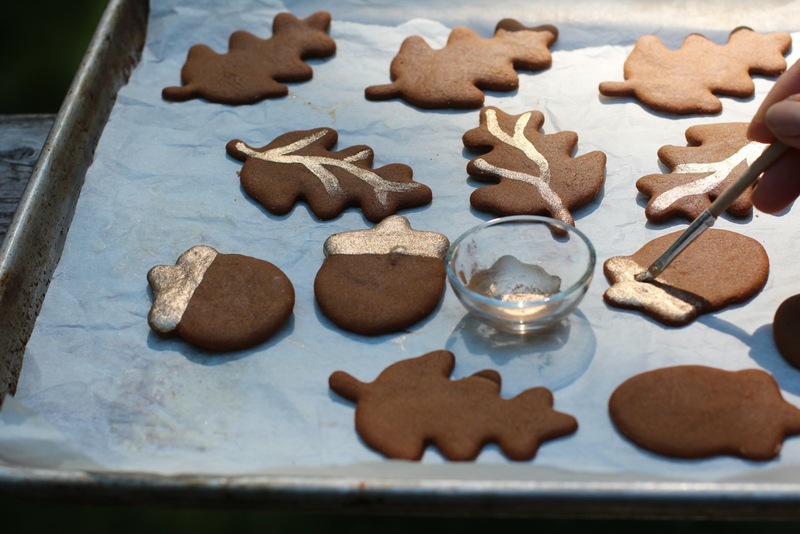 Cut out cookies with shapes of choice and place on prepared cookie sheet 1-inch apart. Repeat with remaining dough. Bake for about 9 minutes or until dry, light golden brown on the bottoms and can be gently lifted from the sheet. Cool cookies on sheets placed on racks for a couple of minutes, then carefully transfer to racks to cool completely. (Cookies may be stored at room temperature in an airtight container for up to 2 weeks). 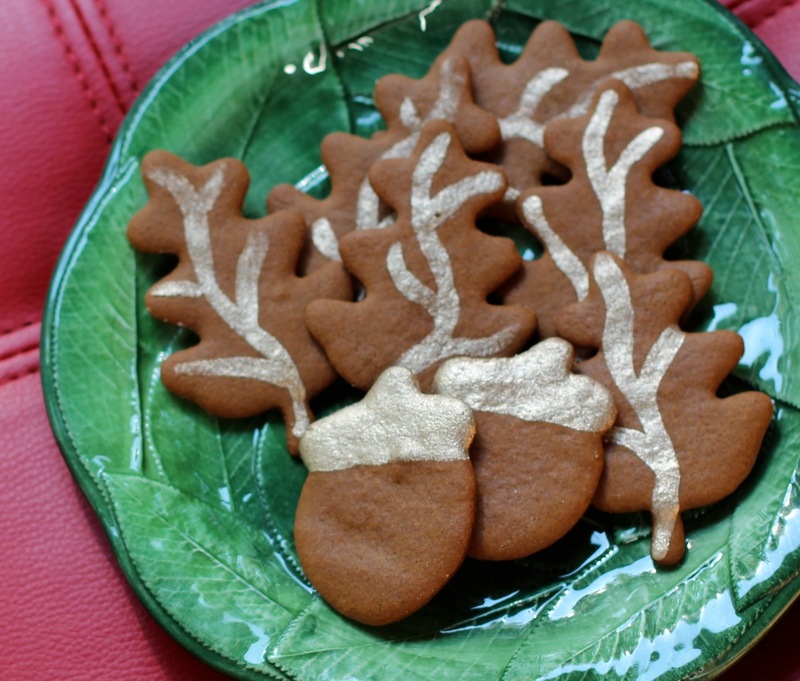 Good Cookie Tip: These cookies can be made into place-cards for your holiday family meal. Simply cut out large simple shapes, such as leaves, and use a parchment cone filled with Royal Icing or melted chocolate to write the names of your guests; then place the cookies on the table to indicate where you would like that guest to sit. Or, as in the photo, use edible metallic powders dissolved in a little vodka or almond extract and use as “paint”. You can find any color you like at Beryls.